The White Dog Blog: Happy Father's Day, Dad! 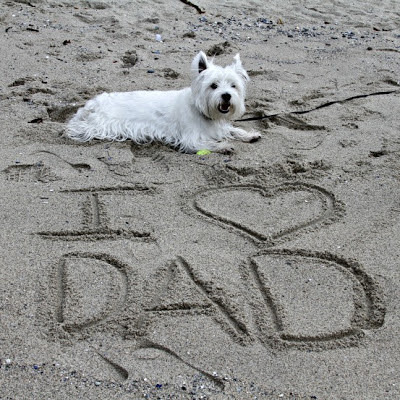 And a big Happy Fathers Day to your Day, bet he really loved the message in the sand! Happy Farthers' Day to your daddy and have a serene Sunday. Opps sorry fathers' day that was supposed to be. AWWWWWW this is a super tribute to your dad!! Aw, that is a great message! Oh, that is the sweetest message EVER Duncan!! sniff, sniff.....he lets you sleep on his HEAD?? Wows, Ma won't even let me sleep on her feets! Tell your Pops Happy Happy Father's Day!! We hope your dad had the bestest day ever, Duncan! I’m happy to seek out your distinguished strategy of developing the publish. Now you let it to become effortless for me to be aware of and implement.